Ani's Book Abyss: Booklikes-opoly | Finished First Book, Onto the Second Roll! 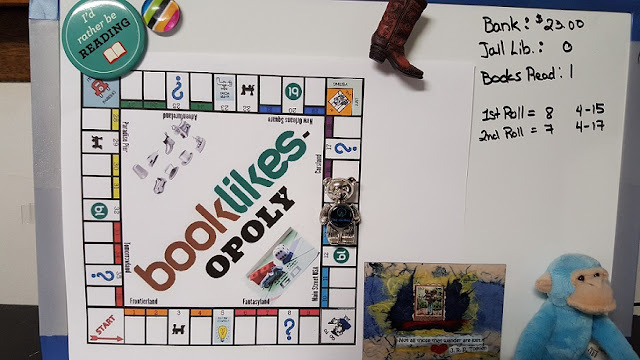 Booklikes-opoly | Finished First Book, Onto the Second Roll! 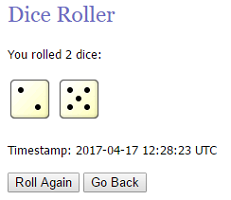 For my first roll, I had gotten an 8 and landed on Mystery Square 8. I read the book A Perilous Undertaking by Deanna Raybourn, which was 345 pages, netting me a $3.00 increase in my bank. A Perilous Undertaking proved to be just as fun and great to read as the first book in the series, so it didn't take me long to finish. Had I not had other obligations, I would have just marathon-ed the entire book in one sitting and had it finished yesterday--I almost did, but realized that if I didn't get some sleep, I would be a very cranky coworker, and no one wants that. Nonetheless, I finished my book in time for the next odd day to roll! I will have a review out soon. 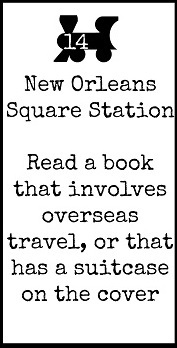 I rolled a 7 and from Mystery Square 8 moved to New Orleans Square Station (14). I realize that Teddy Bear game piece is taking up a lot of room, since he has to hang on the board, and ends up occupying more than one game square. So we will use his neon Ferris Wheel tummy as the central base, so that he can sort of sit on the proper space. Meanwhile Magnetic Monkey is guarding the board, and my magnets are multiplying. Truth: I wish I could make my board a little bit bigger, but this will have to suffice. But honestly, I really don't know which one to choose, no matter that it took a while to figure out which books I could choose from off my TBR. 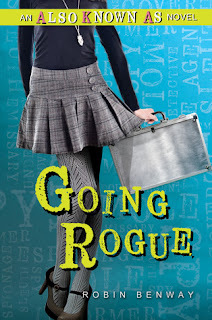 Going Rogue by Robin Benway -- In the summary, it states that our characters will fly to Paris from New York. I have the Kindle edition, listing as 321 pages, which is $3.00 award. I would probably listen to this as an audio, though since I own the Audible. 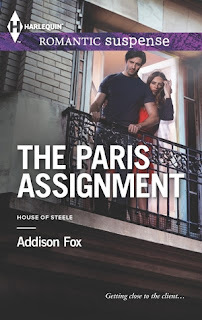 The Paris Assignment by Addison Fox -- The book starts in New York and, as the title shows, we will be going to Paris. I have the Kindle edition, which is 284 pages; $3.00 award. 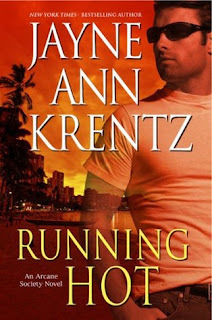 Running Hot by Jayne Ann Krentz -- The characters start in Oregon, and the characters travel to Hawaii. I would be borrowing this book from the library in hard cover; the library lists it as 337 pages. Or I could borrow the e-book via Amazon Kindle, which shows the book as 324 pages. Either way, it would be $3.00 award. 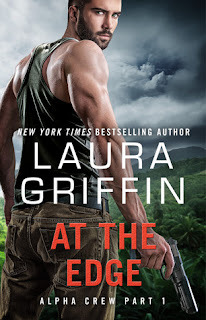 At the Edge by Laura Griffin -- It looks like the story opens in Seattle, and the summary mentions a crash-landing in the Philippines, so overseas travel is definite. Amazon lists the Kindle edition at 122 pages, which would be $2.00 cash award. Either way, it'll take a little bit longer for me to finish this next book, no matter the length since I'll be busy the next few days. And also, I want to focus on finishing up one of my Reading Assignment books, False Memory by Dean Koontz, of which I am only about 35% in... and the book is kind of dragging--300 pages down, ~450 more to go. I feel like this book is a bit endless.